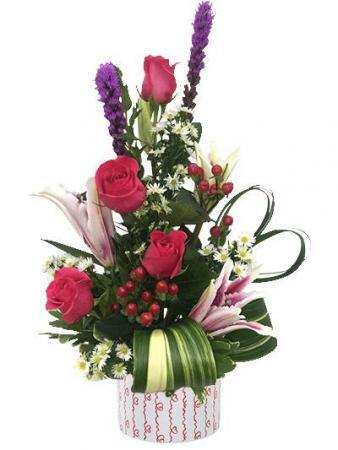 FLOWERAMA EXCLUSIVE Celebrate your sweetheart with this modern design. Includes fresh roses, alstroemeria, stargazer lily, and other flowers to delight them this valentine's day, just because, anniversary, birthday, or other occasions! This flower arrangement looks great in a house or office! 24 Long stemmed Roses arranged with unique greenery and fresh lilies. 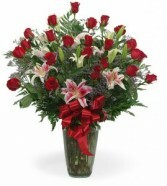 Perfect to celebrate your special occasion, our 2 dozen Premium Roses and lilies vase is as beautiful as the price. Choose from traditional red or call us to ask about our wide variety of colors! 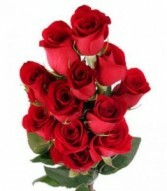 Stop in our store at 490 Woodman Drive, Dayton OH, 45431 for a Dozen Roses In a sleeve starting at Just $14.99. We have many specials and bouquets to choose from. We have many Arrangements ready to take with you or have delivered. Always something New!!! Stop in and see us today! "When it comes to letting her know she’s always on your mind, think pink and lavender. We’ve hand-gathered a romantic mix of pink and purple blooms to create a gorgeous, garden-inspired bouquet. Designed by expert florist Breanna Cartwright of Modesto, CA, this beautiful bunch will remain a fond memory for a long time. Our florists hand-design each arrangement, so colors and varieties may vary due to local availability All-around arrangement with pink roses, Gerbera daisies, Oriental lilies, and larkspur, white snapdragons, and lavender stock"